Nanomechanical Properties of Cell Surfaces With increasingly rapid advancements in bioresearch, there is a growing need for methods that can accurately quantify and map the molecular interactions of biological samples, both with high-force sensitivity and high spatial resolution. 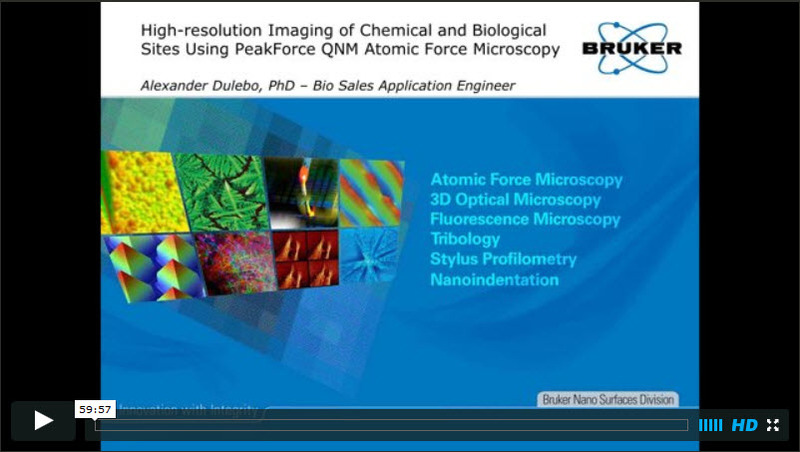 Force-distance (FD) curve-based atomic force microscopy is a valuable tool to simultaneously contour the surface and map the biophysical properties of biological samples at the nanoscale. In this webinar, we will discuss the use of Bruker’s advanced FD-based technology, PeakForce QNM®, combined with chemically functionalized tips to probe the localization and interactions of chemical and biological sites on single native proteins and on living cells at high-resolution. First, we’ll demonstrate the ability of the method to quantify and image hydrophobic forces on organic surfaces and on microbial pathogens. Then, using biochemically sensitive tips, we will detect single sensor proteins on yeast cells, locate specific interaction sites on native protein, and image filamentous bacteriophages extruding from living bacteria at unprecedented resolution. Topography and specific adhesion maps then can be analyzed and correlated either by Bruker’s NanoScope® analysis software tool or Matlab statistical software. Owing to its key capabilities (quantitative mapping, resolution of a few nanometers, and true correlation with topography), this novel biochemically-sensitive imaging technique, based on PeakForce Tapping® technology, is a powerful complement to other advanced AFM modes for quantitative, high-resolution bio-imaging.